For those unfamiliar with the concept, chirashi is basically “stuff on sushi rice”, and it’s a fantastic way to take your sushi out of the roll and into the bowl. For people who don’t like seaweed, it’s a great way to make this kind of combination more accessible. This particular recipe is also incredibly easy to make, assuming your sushi rice doesn’t have some kind of really interesting science-experiment-level reaction with your rice cooker, as mine did, forcing a delay while you make MORE rice on the stove. Yeah, some days are like that. At least it all turned out tasty. As a note, I’ll point out that you don’t have to use the specific items that I recommend; there are other ways around. It’s easy enough to substitute with items that better fit your particular bend or that are easier for you to find (for example, swap the scallops for firm tofu to make it vegetarian). To that end, I’ve broken things up a little, and I’m offering up a couple of solutions to the matter at hand. Lastly, and very importantly, if using items out of a box or a bag, such as sushi rice, please do follow whatever directions exist on the packaging so that you’re cooking the items properly. That may mean adjusting the timing of the different pieces, but a little preparation can make everything ready right at the same time. Substituting regular long-grain white rice for the short-grain sushi rice may not work as well when it comes to the rice wine vinegar/sugar mixture and it won’t have the stickiness of its short-grain cousin, so your mileage may vary depending upon where/how you employ alternate options. Even so, if you taste the combinations as you put them together, you can adjust on the fly and truly make this dish something unique for you. 1. Prepare according to instructions on the package, noting that rice cooker cooking time may be longer than if you cook it on the stove. Best to get the rice going FIRST, since that will be the longest of the items that needs to be made. 2. When the rice is done cooking, measure out the rice wine vinegar into a glass (or other form of microwave-safe) measuring cup; add the sugar and stir to combine. Heat in the microwave on high for 1 minute. 1. When the rice has approximately 20-25 minutes left to cook, add the olive oil to a non-stick pan and heat on medium-high. 2. Wash the scallops and remove the foot from each scallop; then chop into bite-sized pieces. Add the scallops to the pan and stir to coat. 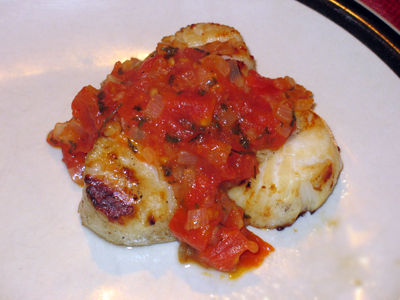 Let the scallops cook for about 3-4 minutes before turning to cook the other side, then add the sherry or cooking wine and move on to the spicy mayo. 3. Spicy mayo can be done with the Japanese or full-fat mayo and EITHER Sriracha (spicy option #1) OR a combination of Tabasco sauce and garlic powder (spicy option #2). In either event, put the mayo into a small glass or other non-reactive bowl and then add the your chosen spicy option. Since “spicy” is all in the tastebuds of the beholder, the quantities I list above are just illustrative; adjust as needed to meet your needs. If the mayo is TOO spicy, add more mayo. If the mayo isn’t spicy enough, add more of your spicy option, noting that if you’re doing the Tabasco/garlic powder combination, you may need to adjust both. Set aside when done. 4. Keep stirring the scallops until they’re fully cooked; typically they’re done by the time the wine has finished cooking off, which can be about 10-15 minutes total cook time from when the scallops went into the pan. 5. 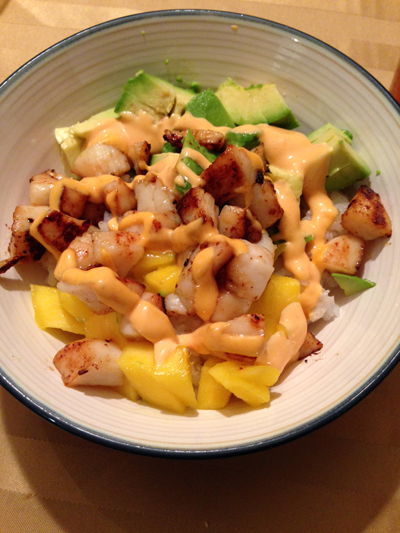 Chop the mango and avocado into bites approximately the same size as the scallops. 6. When the scallops and rice are done, place a layer of rice in the bottom of a bowl, then add half the scallops to the center, in a stripe, followed by stripes on either side with half each of the chopped mango and avocado. Drizzle the spicy mayo on top. You may find that you want to add some soy sauce, as well, if you’re used to having that on rice, so it may be worthwhile to keep a bottle of Kikkoman or Tamari handy. If you decide to do that, I would recommend waiting until after you’ve put the bowl together and then add soy sauce to taste. This is one of those weeks where I just didn’t feel like buying meat. Thing is, we stockpile over the course of the year – a buy-one-get-one-free deal (BOGO) here, a trip to BJ’s there, and there’s just MEAT in the freezer. And, when dh started to explain how we’re just overspending on our grocery bill, I couldn’t stomach the thought of putting out money for fresh meat when I knew we had stuff in the freezer that was just in need of a thaw. And that’s where the salmon comes in. Being that we’re on a sustainable seafood kick that we are trying to make a lifestyle choice, we’d purchased a pair of frozen sockeye salmon packages on a BOGO a few months ago. (The price was decent as a BOGO. Under normal circumstances, it would be overpaying – something like $11.99 for 12oz, which works out to $15.99/lb). We’d grilled the first package not long after getting it, and we found it…dry. Something about it just didn’t work and we attributed this to the fact that it was frozen. 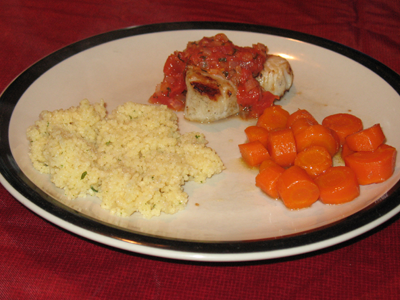 DH was highly skeptical that we could make it work, so he’d been leery about my trying something else with the frozen salmon, but I promised that I would do something on the stove that I thought might add some more moisture. We served this salmon on soba noodles, for a change of pace, and I roasted some golden beets to have on the side. That’s the thing about the CSA – before I started that, I don’t think you’d ever hear me exclaim “OMG! These golden beets are *GORGEOUS*!”, and yet I did that very thing this afternoon. Score one for locally produced veggies and an adult willingness to open one’s mind (and palate) to things that, as a kid, seemed oogy from any distance. Note: the only mod suggested by dh was that the next time we should include shallots, to add even more sweetness. If you want to add shallots, I’d recommend 1 large shallot, peeled and minced, going in the pan at the same time as the salmon (or even just before). 1. Remove the skin from the salmon and cut the salmon into pieces no more than 1″ x 1-1/2″. 2. Heat a non-stick skillet over medium heat; add the olive oil to the pan. 3. Add the salmon to the pan and turn to ensure even cooking after about 2 mins. 4. Add about 1/4-1/3 cup of the white wine to the pan, to start the poaching process. Let this cook until the liquid is reduced by at least half. 5. 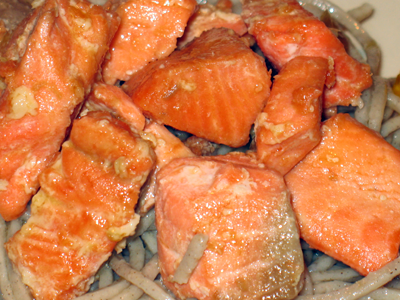 Sprinkle the ginger around the salmon and let it cook for another couple of minutes, until the liquid is mostly gone. 6. Add the remainder of the white wine to the pan. Let this go until the liquid is nearly gone. 7. Drizzle the honey over the salmon pieces and toss/turn to coat them evenly. Let this go until the liquid is down to no more than maybe 1 tsp and serve with rice, noodles (pairs nicely with soba!) or the starch of your choice.